We invite you to submit entries for international coverage in Newspapers, News Services, Digital, Magazines, Radio, Podcasts, Television, Video, Cartoons, Books and Photography. We will begin accepting applications online on November 29, 2017. ELIGIBILITY: Work must be published or broadcast in the U.S. or by a U.S.-based company or be accessible to an American audience for the first time during 2017 with reporting primarily outside the US. A complete list of the 22 awards follows. For more information and to submit an entry, scroll down and click on the blue “submit” button for each award. Best newspaper, news service or digital reporting from abroad. Best newspaper, news service or digital interpretation of international affairs. Best published photographic reporting from abroad requiring exceptional courage and enterprise. Best photographic news reporting from abroad in any medium. Best feature photography published in any medium on an international theme. Best radio or audio, or podcast news or interpretation of international affairs. Best TV or video spot news reporting from abroad. Best TV, video or documentary interpretation of international affairs less than one hour. Best TV, video or documentary about international affairs one hour or longer. Best magazine reporting in print or online on an international story. Best print or online graphic journalism, including cartoons, on international affairs. Best magazine international business news reporting in print or digital. Best international business news reporting in newspapers, news services or digital. Best non-fiction book on international affairs. Best international reporting in the print medium or digital showing a concern for the human condition. Best international reporting in the broadcast media showing a concern for the human condition. Best international reporting in any medium dealing with human rights. Best reporting in any medium on international environmental issues. Best reporting in any medium on Latin America. Best story or series of stories on international affairs using creative and dynamic digital storytelling techniques. Best investigative reporting in any medium on an international story. Best commentary in any medium on international news. Entries can be submitted only through the OPC’s online submission process which will include the application, the work and a brief statement explaining why the entry deserves consideration. Material may be the work of an individual, group or staff but must be on one subject or theme. Each entry is $200, payable via PayPal, credit card or check made out to the Overseas Press Club of America. A corporate check coming from a different source must clearly indicate which entry it underwrites. Important: (Does not apply to video, photo or digital awards) Upload all materials for the entry in A SINGLE PDF document (8-1/2″ x 11″ paper sheet). Copy and paste the text of the story, or stories, into a Word file, even if they were published only in digital form, and then create a PDF. Do not send a separate PDF for each article. Video links can be included in the PDF if appropriate. One organization may submit up to five entries per award, but each entry must comply with the rules for the individual category. Multiple entry fees can be paid with one payment. Books can be submitted only for the Olivier Rebbot award and the Cornelius Ryan Award. All award winners receive a certificate and a $1,000 check. Upload all materials, including permanent web links to the work that will be entered for judging, into a single PDF document (8-1/2″ x 11″ paper size). DO NOT SEND additional materials to the OPC office. GUIDELINES: It is best not to submit “a body of work” such as “reporting from Asia” — these categories are too generalized and too long. We do not set a limit for total number of articles, but it is best to be selective and submit only the strongest material. Book entries will send two hard copies to the OPC office, 40 West 45 Street, New York, NY, 10036. Pictures must provide an accurate and fair representation of the scene witnessed. The content of a picture cannot be altered by adding, rearranging, reversing, distorting or removing people or objects from within the frame. The judges may request to see raw files for review. Send no more than 12 images (images 10 inches at longest dimension, 300 dpi, JPEG) with captions for each image in a separate Word Document and also embedded in the image IPTC information or description field. In addition to photos, you must submit proof of publication. Scan and create a PDF from a newspaper tearsheet, magazine article, book or website link. Upload everything into one .zip folder: images, Word document, proof of publication in PDF and IPTC information. Upload high-resolution images. DO NOT SEND printed cartoons or portfolios to the OPC. Title uploads by award name, nominee’s first initial and last name and entry title (e.g. : thomas_jdoe_title1.jpg). In addition to the cartoons, submit proof of publication — for example, PDF from newspaper or magazine, or website link. Submit no more than 12 images (images 10 inches at longest dimension, 300dpi, JPEG). Upload all images and proof of publication in one zip folder. Work must be published in the U.S. or be accessible to an American audience for the first time during 2016. For cartoons about international events not published originally in English, all entries in the cartoon category should have an English translation provided along with the entry submission. Submissions without a translation will not be considered. For the David Kaplan Award, the Edward R. Murrow Award, the Peter Jennings Award and the David A. Andelman and Pamela Title Award, fill out the online OPC application and include a link to your work making sure that it does not require a password to view. The video may reside on any server, personal or corporate, or on a free service like youtube.com where the video privacy settings are checked as “unlisted” so they are not available in a search query but are viewable to those with a link. Read more about uploading videos longer than 15 minutes on youtube.com and where to update video privacy settings in youtube.com. Required Specifications: .MP4 format, 1080p: 1920 × 1080 or 720p: 1280 × 720, HD, H.264 video codec, AAC audio codec, 384 kbps audio stereo stream. Upload broadcast-quality MP3(s).DO NOT SEND CDs or DVDs to the OPC office. Title uploads by award name, nominee’s first initial and last name and entry number (e.g. : thomas_jdoe_1.mp3). Entries must include: URLs/links to the work(s) nominated and must be available online with no password required. Head judges have the discretion to move an entry to another award if they feel that the entry is submitted in an inappropriate category. 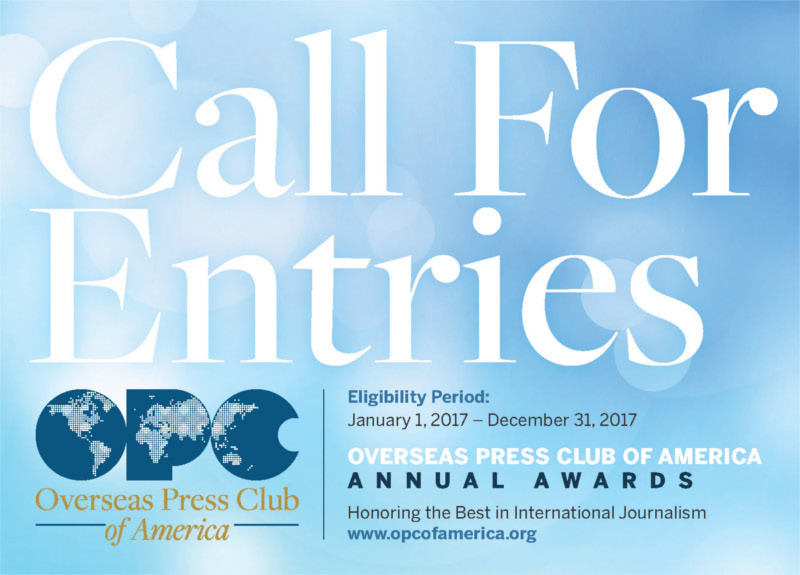 All questions concerning the awards should be directed to Patricia Kranz, Executive Director of the Overseas Press Club of America, 40 West 45 Street, New York, NY, 10036, tel: 212-626-9220 or e-mail selecting “OPC Awards” in the drop-down menu. ENTRIES CANNOT BE RETURNED. SUBMITTING WILL ASSUME PERMISSION FOR THE ENTRY TO APPEAR IN THE OPC MAGAZINE DATELINE, ON THE OPC WEBSITE AND IN OPC PROMOTIONAL MATERIALS FOR THE AWARDS DINNER AND/OR COMPETITION. If you are submitting more than four entries for a media organization, please e-mail a master list of all entries to the OPC office.